THE RAILROAD COMES TO SF? 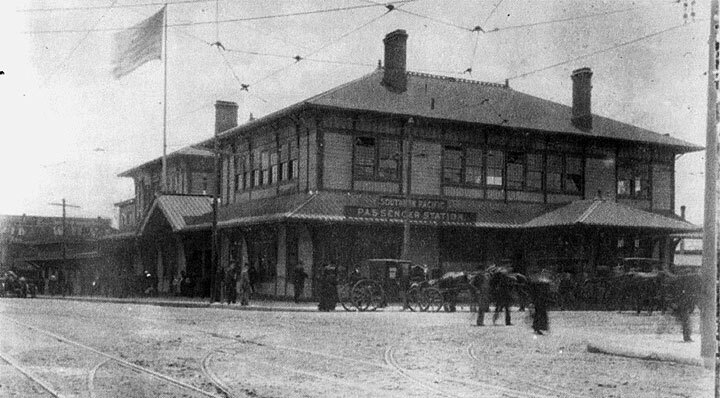 Southern Pacific depot at Townsend and 3rd where it stood from from the 1870s until 1914 when it was replaced by the Spanish revival style depot that lasted until the 1970s. 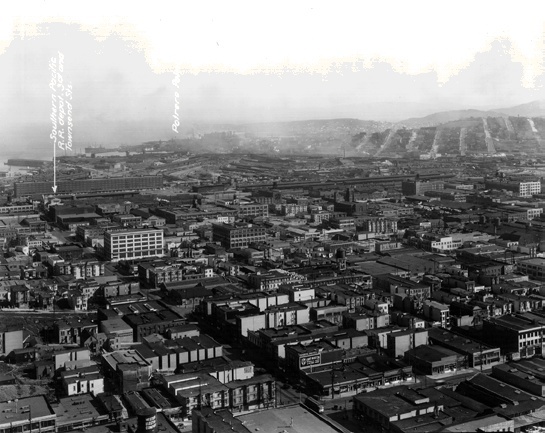 Looking south from the Pacific Telephone and Telegraph Building on New Montgomery, c. 1927. 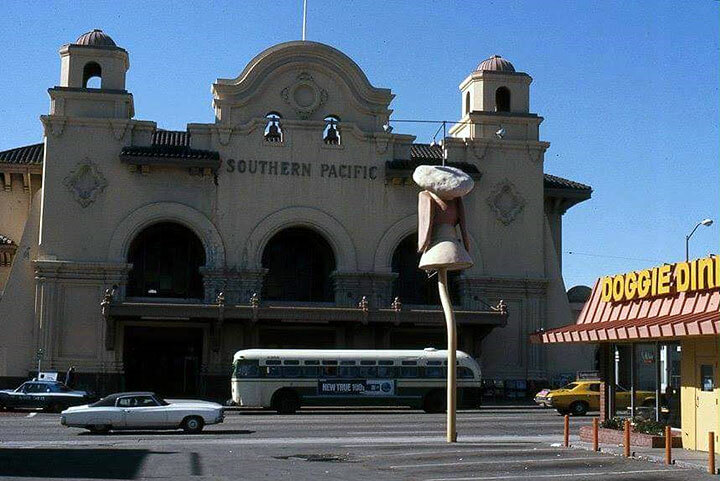 Arrow points to Southern Pacific Depot at 3rd and Townsend. SP Depot, May 7, 1941. 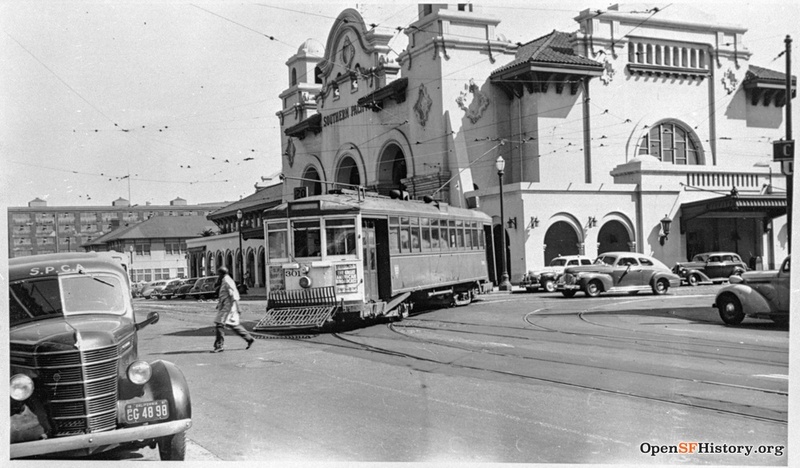 3rd and Townsend, 1941, streetcar leaving terminal to go north towards downtown. 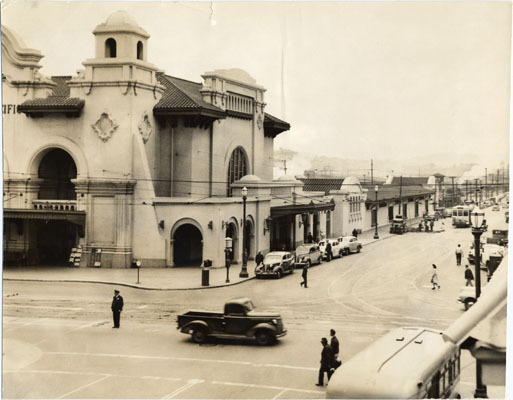 When the transcontinental railroad was completed, and the Big Four (Stanford, Crocker, Hopkins and Huntington) transformed themselves from Sacramento merchants into the controlling interests of the Central Pacific Railroad, San Francisco's elite groped for a way to regain the advantage. Various ideas to build a railroad bridge from the cross-country railroad's terminus in Oakland were floated, but never came to pass. 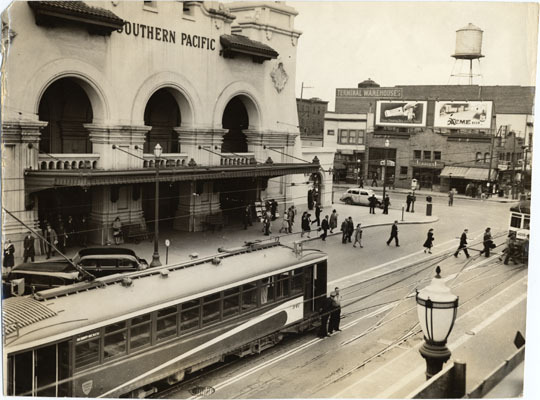 Central Pacific asked San Francisco for a million-dollar subsidy to bring the railroad from the south bay into SF via Mission Bay, but the city's voters turned this plan down narrowly at the polls. Governor Haight was elected as California's executive in 1867, largely due to wide public anger at the efforts of the railroads to grab the land under Mission Bay on outrageous terms. 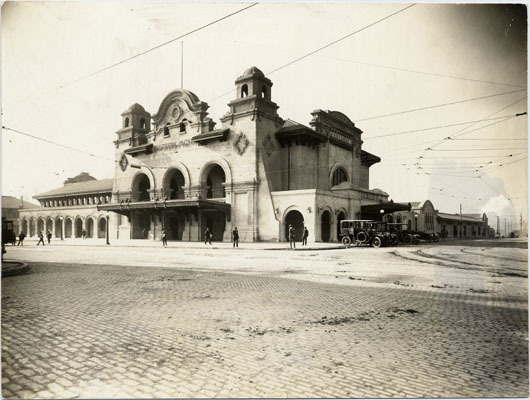 When the Tidelands Bill of 1868 was finally passed, the Central Pacific, Southern Pacific, and Western Pacific railroads were granted a total of 150 acres of Mission Bay land, providing that they built a railroad terminus. This terminal was completed in the early 1870s. 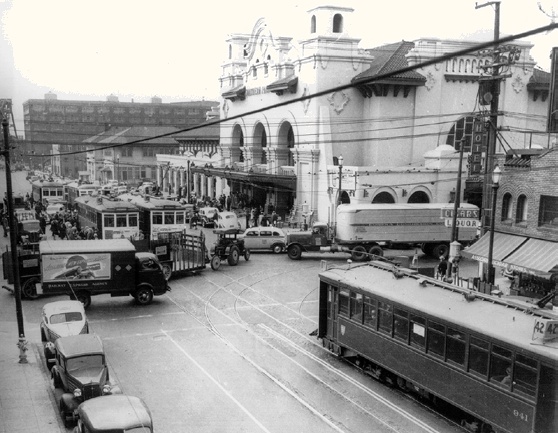 As Mission Bay was gradually filled and the port of San Francisco continued to grow with more and more commerce passing through, railroads were built right up to the docks. By 1896 one of the U.S.'s most efficient systems of beltline railroads was operating between every wharf along SF's waterfront and the numerous railroad warehouses and the terminus built in Mission Bay. The new terminus of the waterfront SF MUNI light rail line at 4th and King, adjacent to the CalTrain Peninsula Commuter Rail depot, provides a huge public subsidy to the speculative goals in Mission Bay, not the least of which is the new SF Giants Ballpark whose right field wall borders the mouth of Mission Creek. 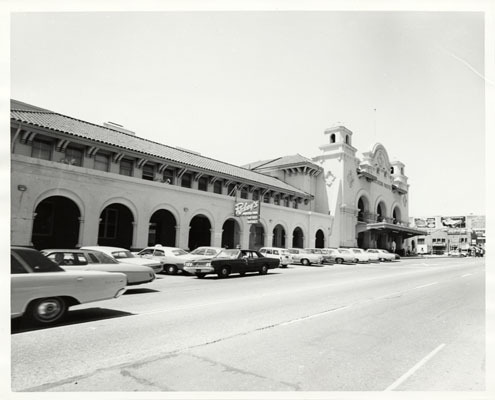 The old Spanish-revival style Southern Pacific Depot served San Francisco for many decades, still standing in this August 1, 1973 photo. 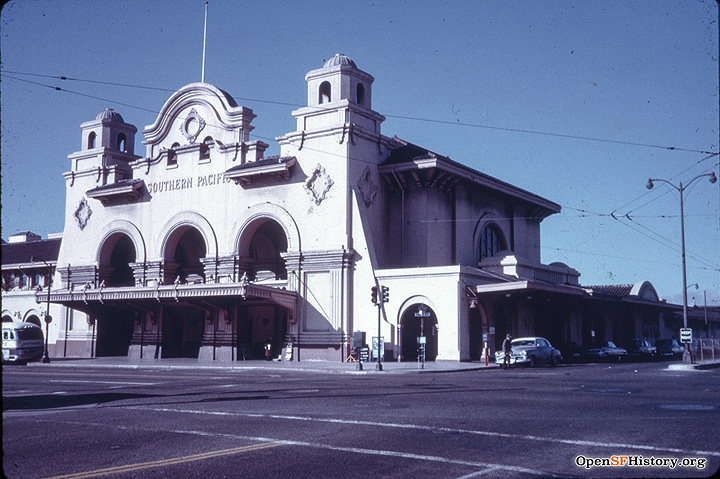 Southern Pacific Depot shortly before its demolition, 1975.